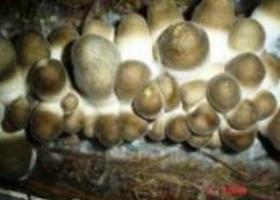 A large number of agriculture, forest and agro-industrial byproducts are useful for growing oyster mushroom. Substrates should be fresh, dry and free from mould infestation. Oyster mushroom can utilize a large number of agro-wastes including straw of wheat, paddy and ragi, stalks and leaves of maize, jowar, bajra, and cotton, sugarcane bagasse, jute and cotton waste, peanut shells, dried grasses, sunflower stalks, used tea leaf and discarded waste paper. It can also be cultivated using industrial wastes like paper mill sludge, coffee by-products, tobacco waste etc. About 1.5 -2.0 kg of good substrate will be required per bag of 80 cm x 40 cm size. Three to four week old non-contaminated spawn @ 10 % of dry weight of the substrate is required for the purpose. Spawn of good quality should be collected from a reliable source. Further, the species / variety should be chosen basing on the temperature and relative humidity of the cropping season of the locality. Just prior to use the 200 gm Spawn is extracted from the bottle with hooked iron rod and divided into four parts. Some of the common supplements are wheat bran, rice bran, soybean cake, groundnut cake, maize meal, horse gram powder, cotton seed meal etc. wheat bran and rice bran should be used at the rate of 10%, while other should be tried @ 3-6% on dry weight basis of the substrate. Supplements after pasteurization are thoroughly mixed with straw while spawning. Addition of supplements increases the substrate temperature and hence, it is risky during the work period to supplement the substrate. Transparent polythene tube of 125-150 gauge with a dimension of 80 cm x 40 cm is suitable for oyster cultivation. Bags of 60 cm x 40 cm may also be used for the purpose. The bags can be reused for the second crop after proper cleaning. Freshly procured good quality substrate is chopped to 4-5 cm size by a chaff cutter and steeped in a chemical solution of carbendazim 50 % WP(75ppm) and formal dehide (500 ppm) for a period of 6 hours. Then the straw is taken out and excess water is to be drained. Ninty liters of water mixed with 7.5 g carbendazim 50% WP and 125 ml formaldehide(37-40%) will be appropriate for the purpose. However seam and hot water treatment methods are preferred as there are reports of phytotoxicity associated with chemical treatment. Here, the pre-wetted substrate after chopping is soaked in hot water (65-700 C ) for one our. In case of steam pasteurization, the pre-wetted straw is steam pasteurized at 60-700 C for one hour, cooled at room temperature and then seeded with spawn. Through pasteurization, the competitor moulds are either killed or their growth is suppressed for 25-40 days after spawning. The substrate is dried in shade for few hours in order to maintain the moisture level of 55-60%. The substrate necessary for raising one bag may be divided into four lots after drying. One end of the polythene tube is tied with a rubber band and the moistened substrate is put inside to a height of 15 cm. Substrate is then gently pressed and one part each of spawn(50g) and supplement(50 g) spread at the periphery close to polythene(See the Video). Like wise, four such layers are made and the bag is closed at the upper end after pressing the substrate. For a bag out of 2 kg of dry straw, 200 g each spawn and supplement will be used. 15-20 small holes(0.5 cm diameter) should be made on all sides to facilitate gas exchange. Instead of layer spawning, mixed spawning may also be followed where the required quantity of spawn is mixed with the prepared substrate(soaked straw) and incorporated into the bag. The bags are then incubated in a well ventilated room at 250 C. During the mycelial growth bags should not be opened. Once the mycelium has fully colonized the substrate forming a thick mycelial mat, it is ready for fruiting. Contaminated bags with mould may be discarded while bags with patchy mycelia growth may be left for few more days for completion of the mycelia growth. These bags are opened after 15-16 days. But in case of P. eous and P. djamore var. are opened after 12 days as fruiting comes out within these. The bundles after opening are arranged on shelves at a distance of 20 cm between each bag in the tier or hanged with plastic rope. Appropriate temperature (20-300 C), humidity(70-80%) and light(200 lux) with good ventilation should be maintained in the cropping room. Bags are watered twice daily depending upon the weather condition. Primordia(small eggs) appears within 4-5 days of opening the bag that came to the harvestable stage 3-4 days later. The mushrooms should be harvested when the cap begins to fold inwards. Picking is done by twisting the mushroom gently without disturbing the surrounding fruit bodies. Crop should not be watered before harvesting. The second crop appears after 7-10 days. Hence within 45 days crop period, 3-4 crops are expected. With exception, under suitable growing condition, a biological efficiency of 100% is achieved in commercial farms. Yield Per Bag : 1.5 kg - 2.0 Kg. Air Exchange is required During Mycelium Run ? ?